Life On A Bike in KW is a series of posts about Chris' attempt to get as much done as possible on two wheels, while Erin takes the car out of town to observe birds. How cycle-friendly is KW? Erin heads out of town this weekend. You can follow her bird-nerding adventures on a blog aptly titled Adventures of a Bird Nerd. And since she's taking the car, my countdown is on. Erin wishes her bird nerding would be this awesome. The funny part is that to a large extent, things won't change next week. (When it comes to getting around, that is-- Erin's absence will certainly affect my life for the next few months!) After all, I'm already cycling to work 3 or 4 days a week. How much different will this be? Groceries: I can do it, but I have to think about volume and weight. When I started thinking about this, I realize that despite the fact that I have reduced my personal car dependence quite far, it's the last mile (so to speak) which is the least flexible. Alternatives exist for specific things, like I know where to get more parakeet food in town, conveniently on my way home-- but at almost twice the cost. 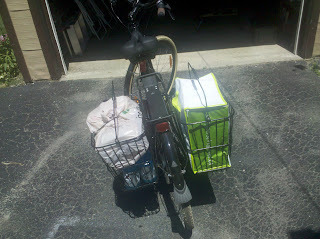 Hardware stores tend to offer delivery. A big, less obvious benefit of car ownership is that you don't have to think about this sort of thing very hard. You make a decision and go. Your cargo capacity is enough to handle almost any need. You can go further to get the best deal. You can go whatever the conditions are, and you have secure storage on hand for multi-stop trips. Handles with all the grace of a pregnant sow. ... and this past weekend, I proved that they had the strength to carry 24 cans of pop on one side, and 5kg of ice on the other. 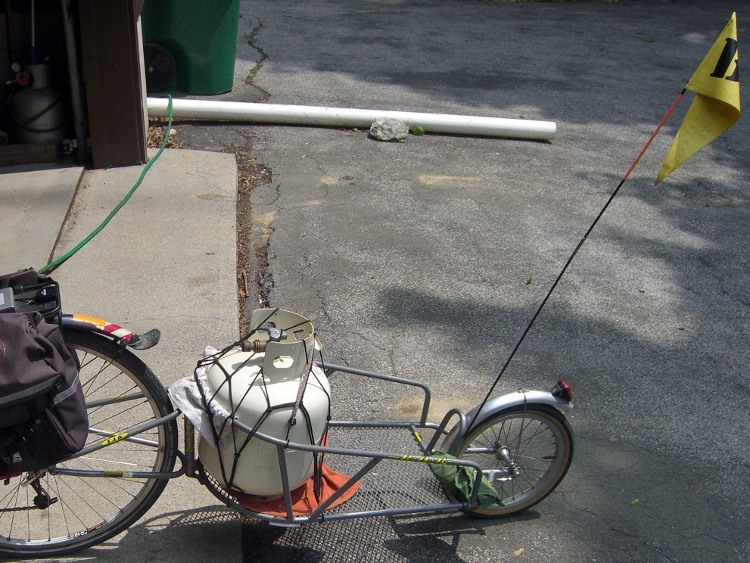 That's good, but there's no way I'm fitting a 20lb propane tank or a 5-gallon water jug in there. There will be the point at which I turn to Car Share. And there's always transit, too. Though this guy has figured it out. It's clear that car ownership is simpler, and while driving an owned car is certainly not free, a single trip feels virtually free-- purchase, insurance, maintenance and even to a certain extent gasoline all feel like fixed overheads. (Yes, I believe it's easy to think of fuel as a fixed overhead: ask yourself if you mentally debited $1 from your budget the last time you drove 10km.) Car ownership feels like a flat rate that once you pay, you get a lot of convenience for free. People like that sort of thing. Car Share and transit are pay-as-you-go, and they come with the (sometimes uncomfortably obvious) awareness of what each trip costs. Do I want to take a Car Share vehicle for an hour ($10 on my plan) to get a $15 propane tank fill? Or spend $70 to visit my parents? That incremental cost seems outrageously expensive, but it has to be compared against the cost of buying and running a new car ($8-$13K a year) or even keeping a cheaper used car on the road. It seems clear to me that there will be opportunities to trade time for money, and money for time. Overall, there will be a drive (no pun intended) to seek efficiencies: combine trips, buy in bulk, choose destinations based on accessibility rather than bargain-hunting across town. And of course, do as much as I can on two wheels, for free. Next time... the tools of the trade! For out of town trips, especially anything involving a longer drive, I've found that renting a car is cheaper than using the CarShare, especially if you can get a weekend rental deal. Ironically, I just discovered the same thing, researching visits to E.
I had ideas about transit, but 3.5 hours just to get to Grimsby? For about the same round trip cost? This province'study inter-city transit is a disaster. In some cities (particularly those with large numbers of seniors) it's common to find grocery stores that will deliver. You buy your groceries and bag them, but they take them and put them in cold storage until they're ready to do a delivery run. It works great for those of us without cars. Sadly, no such option for KW yet (as far as I know), but maybe as the population ages, it will be come a necessity. [LOABkw] Signalling. Also, black pickup trucks?